"Deficit Commission", "Fiscal Commission Co-Chairs' Report Series", "Fiscal Commission", "federal budget", "income tax"
There's a storm over the release of the co-chairs' proposal of the Presidential Commission on Fiscal Responsibility and Reform. When it comes to changes in federal health spending, the proposal rightly raises concern, and I will have more to say about its Social Security and Medicare provisions later. The proposal, however, is about more than just that. It is about a wide range of changes to the federal budget and the federal tax code. While a lot of it entails painful choices, the proposal presents some unique and valuable opportunities for progressives that most of the coverage is completely missing. So today I start this small series to cover Chairs' proposal in detail. Today's part will focus on the income tax reform proposals (both individual and corporate). Before I go any further, let me say this: the proposal we are discussing is the Co-Chair's draft proposal, not one released by the entire commission, whose recommendations are due on December 1. When it is released, I plan to cover it in detail. Keep an eye on The People's View for coverage. A lot of liberal activists are prone to put up a defensive wall as soon as the words "tax reform" are spoken, as the right has used it to serve their regressive tax agenda. But the tax reform proposals by the co-chairs of the Fiscal Commission are thought-provoking and mostly with progressive policy merit. They propose three plans, which I will go through one by one. 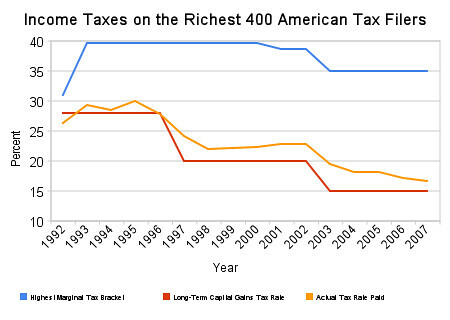 As you can see, the richest people in this country pay a tax rate barely more than 15%. Treat their capital gains as regular income, and the tycoons will have to pay 24%. I think it's important to note this: This plan raises the effective tax rate on the rich. To the degree that progressives agree the rich should pay a better share of their income in taxes, this is a progressive tax plan. The story is the same on the corporate tax rate. Yes, the Zero Plan proposal reduces the baseline corporate tax rate to 26% from the current 35%, but what tax rate do our largest corporations pay, really? General Electric paid zero taxes in the US last year, despite an income of $10.3 billion. Since all tax expenditures (read deferments) for businesses are also eliminated in the Zero Plan, smart accounting or offshoring the profits will no longer shield large multinationals from having to pay their taxes in the US. Now, let's talk about the elimination of deductions for a second. The baseline of the Zero Plan eliminates all deductions, and then raises the rates as deductions are put back in. As someone who now works for and has spent much of my career working for charitable organizations, one would think I would oppose eliminating deductions, especially for charitable donations. But the truth is that vast majority of donors do not donate enough to claim an advantage by itemizing their deductions vs simply claiming the standard deduction. It is arguable that an overall lower tax rate will in fact compel more charitable donations from people who will now have a greater amount of discretionary income. The other sticking point is the mortgage interest deduction. First of all, progressives should recognize an inconvenient truth: this deduction is a regressive form of taxation. The more expensive a house you are able to afford, the bigger your loan and the greater your deduction, not to mention it discriminates heavily against renters, who get no tax deductions on their living costs. Second, a lower overall tax rate should eliminate the need for this exemption and put everyone on an equal footing. 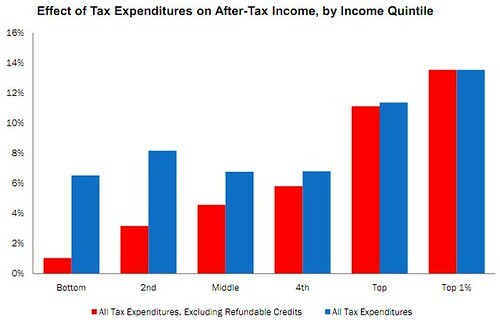 As you can see, tax expenditures (itemized deductions) are overall regressive, as the richest benefit the most from it. The second is the Wyden-Gregg option, which may be the more palatable one in a politically charged Congress, follows the Wyden-Gregg tax reform proposals. It also simplifies the tax code to three individual marginal tax rates - 15%, 25% and 35%, while tripling the standard deduction to $15,000 for individuals and $30,000 for joint tax filers. If the tax rates are at the ones presented, the standard deduction will be hugely important, especially to people of lesser means. It caps charitable donation deduction to 2% of adjusted gross income (i.e. your income after your deductions; in most case after the standard deduction). In another progressive move, the Wyden-Gregg plan eliminates the mortgage interest deductions for second homes, home values over $500,000 and on home equity. It also caps income tax exclusions for your employer's health plan to the amount of actuarial value of the average FEHBP plan. Yes, this will cause plenty of consternation among the same union representatives who opposed the Cadillac tax on the federal health reform law for highly expensive health plans, but there is no escaping the regressiveness of this exemption. Those who do not have employer provided health care (or are unable to afford what their employer provides) are unable to take advantage of this, and this will help reduce health care costs by having employers create pressure on insurers to create health insurance choices with better value. Like the Zero Plan, the Wyden-Gregg plan also reduces the corporate tax rate to 26%. But it also permanently extends the research tax credit, while eliminating several other deductions, including the subsidies to oil and gas companies. The third option is basically a haircut on all personal and corporate tax deductions, and not much specific is provided. Before concluding, I also want to point out things that are not in this proposal that many on the left had feared could be. This proposal does not propose eliminating or changing the inheritance tax, for example. If fears of the commission being packed with conservative ideologues were true, given the how high this priority ranks among both conservative activists and think tanks, I do not see how this would not make it in. There is also no proposal to replace the federal income tax with a regressive national sales tax. In fact, there are no additional tax cuts on the rich in this proposal. There are no carve-outs for industry. Instead it proposes simplifying the tax code and making the super rich and corporations actually pay what they are supposed to pay under the law. When it comes to the tax reform proposals, as this article discusses, progressives have a big opportunity to reshape our tax structure if we truly believe in progressive taxation and fiscal discipline. Intellectual gravitas is going to be more important in this debate than political war, if we are to do anything meaningful. Nov 11 So Many Vets And So Few Who Really Do Care For Them Except On Nov. 11th!